The fact that less than one percent of the population has a problem with gluten yet twenty percent buy gluten free products is a testament to the power of marketing. It would seem perception is nine tenths reality. 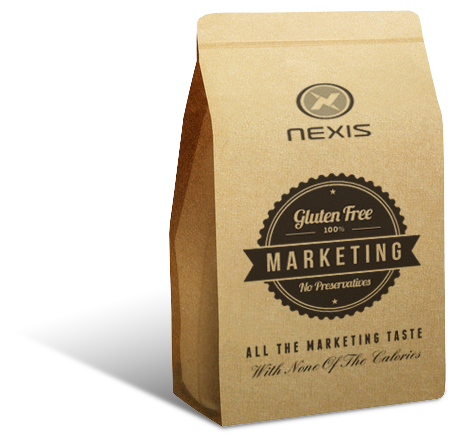 Nexis is a new start up Advertising, Marketing Design firm lead by Jeff Steelman. With over twenty years experience. Our goal is to be a full-service creative digital agency that focuses on design, advertising and innovation to solve business problems for our clients. and not only to you but to all your other customers. This may presents more challenges when you have an unhappy customer but it is also an opportunity to gain powerful insight into the wishes, desires and needs of your customers. Let us show you what we can do, improve your Brand’s image, design a marketing plan or new product launch, make sure you communicate a consistent branded marketing message across all your customers touch points. We don’t mind criticism but we love praise. Go ahead bother us it’s free!